Last week we posted the pictures of this fabulous wedding that we planned and coordianted in June. We are delighted to share the rest of the pictures. 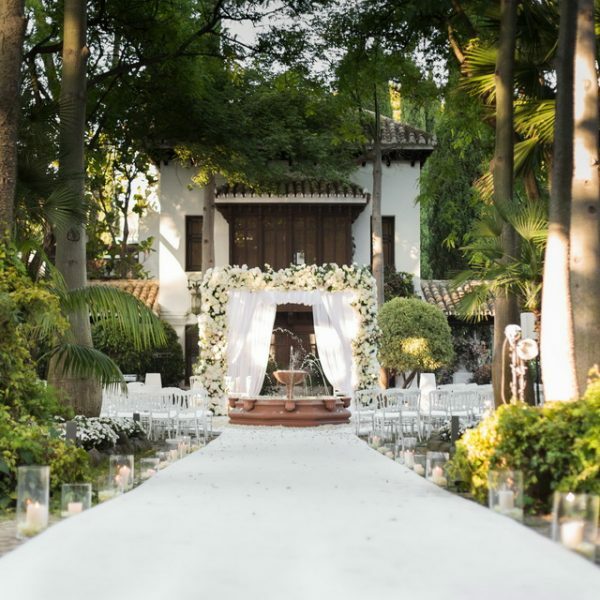 The reception took place in a private villa so we had a totally different set up to the one done in Villa Padierna, in Marbella (Malaga – Spain). The guests were welcome by cocktails and guided to the reception area for more drinks and canapes. The catering was done beautifully by Salduna Catering. French style sofas and big flower arrangements were the main focus point of this part of the wedding. The table seating plan individually done per table using engraved acrylic was done by the amazing designer Anoulka from Nulki Nulks. Also she created the finger prints tree, the hand holders as a gift for the ladies and the welcome signs on a engraved stone. Anna Sargeant played the harp while the guests where arriving and then the cocktail hour. After the reception, the guests were guided to the photo call area to have a picture taken. The pictures were printed on the day so the guests could take a copy on their departure. The photocall was a wall of roses and hydrangeas with a big vase full of grapes. To enter the magnificient marquee, the guests had to go through a tunnel done using fairy lights and green, it was breaktaking. The transparent marquee decorated with fabric of 3 different colours, crystal chandeliers, fairy lights and flowers. The pool was covered with a transparent stage and under it we have floating flowers. All the rental material including tables, chairs, glasseware, cutlery, tables for the buffet and many other decorative items were provided by Pedro Navarro Estetica de Espacios. Table numbers, engraved stones with J&A´s logo as favours, pencils, menu cards, name cards and logo were created by Nulki Nulks. The dinner was a buffet including Belgium and Portuguese delicatessen among other things done by Salduna Catering. The buffet roof area was decorated with lamps and fabric to soft the area and give more elegance and a special touch. For the dessert area, Salduna provided the garden dessert corner, wraffles, crêpes. We could not resist to combine all these sweet things with amazing desserts from Dalua coming from Elche. The disco lighting, effects, sound system for singers and Dj, and plasma TV was provided by Chez Vous. Georgina O’Neill together with Dj Johnny Saccone were all night entertaining the guests. We also had a Magician coming from Phoenix (USA), Eric Gillian, who done a fantastic performance. Before the first dance, two dancers coming from Barcelona coordinated by Pino Palma Producciones, performed a dance routine recreating their love story. At the end of the performance, J&A received a sculpure of themselves done on site during the reception drinks. The wedding cake was done by Sweet Things, always delicious. These pictures taken by Romance Weddings show all the work done for a whole year and we can not be more proud. We cant wait to see the video from Studio Krrusel. Special thanks to our clients, J&A, for letting us be part of this special day and trusting that we could make their dream come true. Thank you so much to all the suppliers involve in this wedding without them, our job as planners would not be possible.